The village of Robidišče lies on the western edge of Slovenia. From the north, west and south it is enclosed by the state border. Across the border lies the Venetian Slovenia to which the village always gravitated. The old village is itself a living monument of times past. To reach Robidišče you need to take the road for Breginj. In Borjana you take a turn for Podbela and then pass the village of Podbela, pass the Napoleon Bridge and continue to Robidišče. In Middle Ages this area was owned by the Patriarch of Aquileia. Later the village came under the Venetian republic. The Venetian republic was disbanded by Napoleon. The area became a part of the Habsburg Empire until 1866 when it was incorporated into the kingdom of Italy. After WW2 in 1947 Robidišče was cut off from Venetian Slovenia by the Iron curtain. Because of this more than 150 locals packed their belongings onto wagons, crossed the border into Italy and never returned. The village was drastically changed in 1976 when an earthquake with magnitude 8 on Richter scale shook the village. The reconstruction of the village was never completed and the village decreased. In 1869 the village had 178 inhabitants and in 1910 the number rose to 228. In 1991 there were only 17 people living in Robidišče and the number fell to 8 in 2000. Robidišče is a nice starting point for hiking in the neighbourhood and admiring the old architecture. The highlight is the Vanče’s house which is over 300 years old and in which the original smoke kitchen is preserved. We also recommend visiting the ECO tourist farm Robidišče, where you can try homemade sheep cheese. 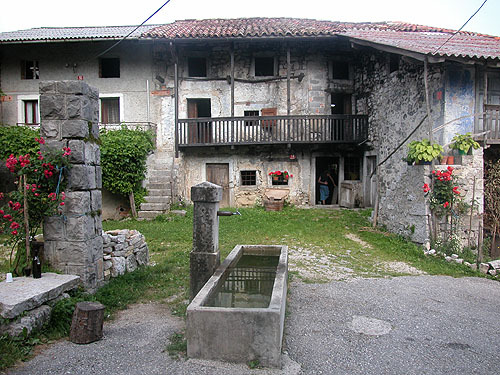 The unique type of construction found in Robidišče (Venetian Slovenian type) is characterized by buildings from hewn stone blocks with outer stone stairways and wooden exterior corridors called ganks. 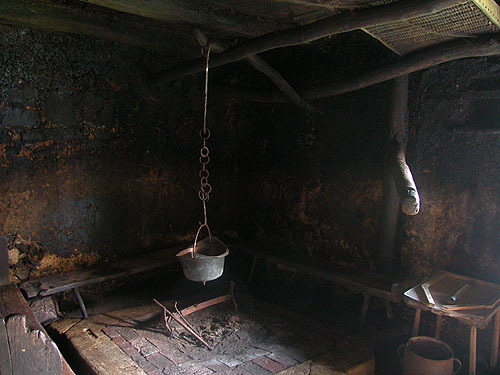 Vanče’s house is a typical such house with the low open smoke kitchen. This type of smoke kitchen was once spread in the whole region, but it is very rare now. Museum holds several old house and agricultural objects and also a collection of old photographs taken in 1951 which were provided by the Slovenian ethnographic museum.